I heard about Threads For Teens a while back while watching the Halo Awards on Nickelodeon. As a 12 year old at the time, something clicked. I knew that this was something that needed to be done on Kauai. I am compelled to be involved because I always have been interested in fashion. I realize how much I take for granted. Going to school with a brand new outfit- that feeling of confidence is indescribable. I want to channel my energy in making sure everybody has a chance to feel that sensation of empowerment. What better way to make that feeling happen by giving new clothing to girls? What are your goals for Threads for Teens Kauai? I hope to inspire the lives of girls on Kauai. Sometimes we all need to take a step back and change our perspective on things. I want these girls to walk out of the pop up event with a new idea. There is no such thing as “can’t”. After all, it was the little engine that thought he could. Coming from a small Island in the middle of the Pacific Ocean, it sometimes seems like there’s no options or opportunities. T-shirts, shorts, and slippers sum up the common fashion look here. Spicing up styles and giving options to these girls will definitely impact the way they will look at what’s in store for them. Girl empowerment is huge. It is extremely important mainly because we live in a world full of women. If we are able to break down the wall of gender stereotypes and work together, there is so much that can be done. Some of us just don’t know we have the power in ourselves to create change. This is why empowerment is key. When we teach girls that we have the ability to make a difference, that knowledge becomes the root of transformation in today’s society. We are our biggest advocates. We need to know how to use that power for good. I have many role models in my life. The one closest to me is my mom. She is like Superwoman, she’s able to fight off the evil in the world and help the lives of many. She has been my backbone while working on the pop up event by keeping me sane, coming up with new ideas, spell- checking important emails, and so much more. Allyson Ahlstrom is a role model to me too. She is very inspiring, and to be able to give the gift of hope to others is truly amazing. I have been making a lot of progress to make this pop up event happen. I have secured a beautiful location at the Kauai Marriott ballroom. I’ve been trying my best to spread the word about this event by contacting many different organizations, businesses, and individuals. Bethany Hamilton might even make a surprise visit at the event as a guest speaker. I also have a team of stylists excited to help out too! There is still a lot of details and logistics to be worked out. I am very excited for this event to come together! This experience of working with Threads For Teens is amazing. Putting myself out in the community helps me realize what the real world is actually like. This journey is like a roller coaster with its ups and downs. The most challenging part for me has been finding participants. HERE is a link to a recent letter I sent to our local Newspaper. Want to become involved? Check out this flyer here for more information! 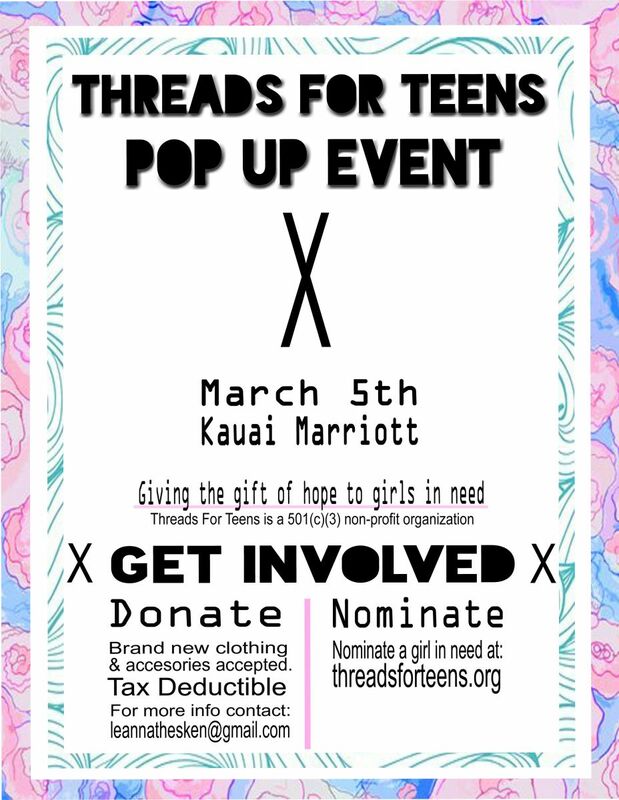 Threads for Teens will host an event in HawaiI! I am the co-founder of 1Closet, we are ~2hours away from Allyson and have collected nearly 100K teen garments both new and gently worn, I would encourage you to tap into local affluent areas, the garments are often amazing! As a mom of a college daughter it’s common place to shop at Plato’s Closet, Buffalo Exchange or Crossroads, young adult focused consignment stores – gently used is ok.